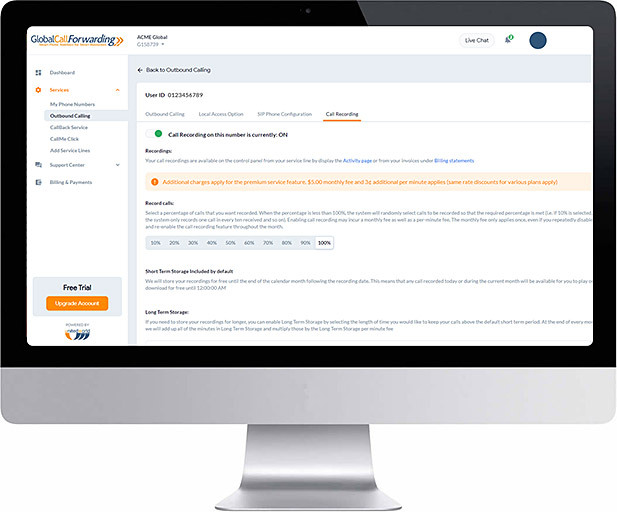 Call recording is a telephone feature that enables you to automatically record your inbound calls. You are able to select any of your call forwarding number(s) to record and save calls from. Setup is simple and the feature can be activated instantly through the United World Telecom online control panel. Once activated, all calls made to your selected number will be recorded and the file is saved for your convenience to revisit at a later time. By default, the feature is programmed to record 100% of the call traffic received on the selected number, but you are able to change the settings and record a smaller percentage of calls. For example: record 10% of inbound calls, meaning 1 in every 10 calls received will be recorded. United World Telecom offers call recording at very affordable rates. The monthly fee and cost per minute varies with the service plan you are enrolled in. When comparing the benefits of call recording to the cost, the service essentially pays for itself. For new customers, activate call recording on your selected service number(s) select the Call Recording option that corresponds to the plan you selected on the view rates page and then select “Add to Cart” to complete your call forwarding order. For existing customers, log in to your online control panel at uwtcallback.com and select the red “Call Recording” activation button on the phone number you would like to record. The Call Recording plan and settings page will open automatically. Select the call recording plan, check your service preferences, and click save. To verify that Call Recording has been activated on the selected service lines(s), close the call recording plan and settings page and check that all selected service lines show the “Manage Call Recording” button instead. With United World Telecom, customers can enjoy unlimited call recording. There is no limit to the number or length of your calls you would like to record. Furthermore, recorded calls are available in storage for up to six months. Long term storage is also available and is subject to the same per minute rate. Additional storage charges will be calculated based on the total number of call minutes stored per month x corresponding per minute rate. You may playback or download your recorded calls at anytime. Simply log into your online control panel and find the selected service line with call recording. Open the billing statement and find the month and phone call you would like to listen to and click the call recording icon. Call recording can also be used for employee training, in reviewing the dos and don’ts related to customer service. Managers can also closely analyze what customers needs are and devise ways to improve upon current strategies. Business managers can additionally use these recorded calls to gather great customer satisfaction stories when a customer points out features of a product or service that they are particularly happy with. In a similar way, a database of recorded calls can provide a good analysis of the progress the company has made by comparing methods of handling things in the past to current, more improved methods. In relation to marketing, call recording can help the marketing team to improve their understanding of the company’s target market. By listening to a variety of customer calls, the marketing team can learn about how the techniques they have put into effect for the customer they have targeted actually compares to the customer type that is actually using the company’s product and/ or services. For example, a company is targeting customers who are in their mid- to late 30s and are professional, and their marketing plan is targeted specifically to this profile. Call recording can help the marketing team as an invaluable reference, enabling them to go back and listen to recordings to see if they are, in fact, attracting the mid- to late 30s professionals, or if they are in fact attracting a completely different type of customer. This can have a huge impact on marketing efforts – making the team more efficient and their efforts more impactful. Call recording can also be utilized to meet regulatory-compliance guidelines, depending on the sector the business operates in. Call recording can aid in resolving a dispute or defend against litigation. Considering the high cost of litigation, the cost of a call recording feature is clearly minimal in comparison. Call recording is a small and low-cost way to more closely monitor a business and put any necessary changes into effect. United World Telecom provides call recording features to help business owners maximize business practices in today’s extremely competitive market. When businesses are looking at the big picture in mapping out efforts and goals, it is often easy to miss small efforts that could possibly make a very significant impact. Call recording is very well one of those small efforts, with a low cost of investment, that could potentially present a large impact. United World Telecom has been built around a solid focus of providing consistently advanced methods of communicating to aid businesses in achieving success. With this at the core of United World Telecom’s efforts, customer service specialists are well positioned to go over a business’ needs with the business owners and/ or managers, and advise upon what service and features are best suited for the company. United World Telecom services include international virtual phone numbers, toll free numbers, local phone numbers, international phone numbers, port/ number transferring, call forwarding, virtual phone numbers, DID numbers, personal 800 numbers, international call forwarding, international toll free numbers, local business phone numbers, toll free 800 numbers, vanity phone numbers, virtual toll free numbers and ITFS numbers. In addition to the call recording feature, United World Telecom offers advanced IVR/ PBX, Enterprise API, customized greeting, time of day routing, failover forwarding, voicemail to email, fax to email, SMS forwarding, local ringback tone, simultaneous ringing, sequential forwarding, select country forwarding, streamlined account management, call transfer, black and white lists, and rollover minutes. No matter how big or small the company may be, United World Telecom is dedicated to helping each and every company reach their telecommunication goals with excellent customer service, advanced service options, and an extended list of convenient features to choose from. Contact us today to learn more about our many dynamic services.